I have seen a couple of these Arriva Cross Country trains in the new livery but this is the first time I have managed to get a decent shot of them. I was at Plymouth Station on Sunday waiting for the First Great Western from Paddington which was 40 mins late. I must admit I think that the livery really suits these trains, although I prefer the HSTs as much better trains. Thanks a_c_e I shall look out for them in the future. They should look smart in the new colours. I think there are two Saturday-only sets hired in and operating from 'somewhere up North' to/from Newquay as from the 24th May, with the extra sets mentioned running Saturdays from late July until early September. Sorry I can't be more specific but no doubt there is someone out there who can! Graham: Keep up the good work on your interesting, varied and informative blog. As you may recall the images of the PD2s in the late 1950's published a few months back brought back many happy memories of my childhood in the Plymouth area. Any chance of any more of those shots please!? I think I have the required information re these additional HST workings, courtesy of page 48 of the excellent RAIL EXPRESS magazine dated May 2008. As from May 24th Cross Country(XC) set XC05 (formed of power cars 43104/66 and coaches 41035/6, 42342, 42051-3 and 44017) will, along with another unknown set hired in, operate the Saturdays-only 0940 Newcastle- Newquay and 0941 Newcastle-Newquay services throughout the summer. 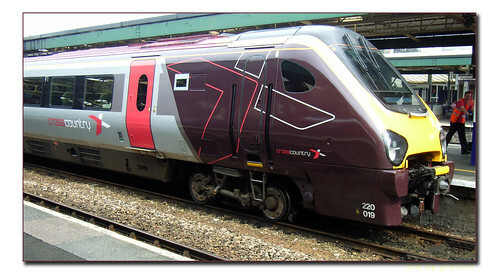 Joining them as from July 5th until August 30th (presumably also Saturdays only) will be a further two trains hired in from NXEC (which I think stands for National Express East Coast) and they will operate the 0724 Manchester-Newquay and 1522 return service, and the 0735 Bristol-Paignton and 1032 return service respectively. I hope this helps and perhaps presents you with some photographic opportunities? Thanks for this Dave. I does present with some good photo opportunities so I will have to get down there on a Saturday sometime soon. I always keep an eye out for the older photos so hopefully some more to post soon!